Geoffrey West is a theoretical physicist and interdisciplinary scientist; he’s distinguished professor and past president of the Santa Fe Institute, and his new book is Scale: The Universal Laws of Growth, Innovation, Sustainability, and the Pace of Life in Organisms, Cities, Economies, and Companies, a fascinating exploration of fundamental laws underlying biological life and human-created systems. Mary-Charlotte Domandi: Today we’re talking to Geoff West. He’s a theoretical physicist and interdisciplinary scientist. He’s a distinguished professor at and past president of the Santa Fe Institute. His new book is Scale: The Universal Laws of Growth, Innovation, Sustainability, and the Pace of Life in Organisms, Cities, Economies, and Companies. This is a book that ranges over so many topics: animals and plants and really all living organisms, ecosystems, economies, cities, and all different kinds of social networks, basically so many of the structures that make up the fabric of our lives. The basic idea is that, just as there are laws of physics that explain how the world works—why the sky is blue, how the force of gravity works, and so on—there are also universal laws underlying biological life. Even as it is continually evolving and changing, there are some basic building blocks and laws that explain how animals and plants put them together, including some very real limits. For example, if you want to find out where there can be no Godzilla, well, you’ll have to read the book. It’s a wonderfully written work; it’s accessible to scientists and non-scientists alike, and it’s full of anecdotes and digressions that give you a sense of the writer and his experiences, and the practice of science. One of the things that really fascinated me about it was that one gets a glimpse into the process by which scientists from different fields come together and really have to learn each other’s languages and ways of thinking, and could thereby contribute to something that couldn’t really be embraced by any one field within science. It made me think about the whole issue of what questions get asked in the first place. Are we asking the right questions? Are we asking the big questions? What kinds of institutions and teams are necessary, to really delve into those big, unwieldy questions, like the ones in this book? 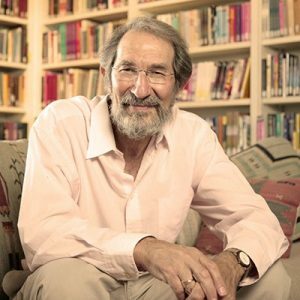 Geoffrey West: Thank you, Mary-Charlotte. Nice to be with you again. MC: Nice to be with you, too. Describe for us the process by which you went from theoretical physics to the study of biology and social systems: how did that happen, and what was it like to make the transition between studying matter to studying life? How did your being a physicist inform the way you study life? GW: Yes, it’s got many components to it. It happened, to a large extent, serendipitously, really. On the one hand, it was directed in the sense that a whole bunch of questions that I’ve always been interested in were always in the background, but some of it was stimulated by the fact that, while I was still at Los Alamos, we were very much involved in something called the superconducting supercollider. It’s a big particle accelerator at enormous energies, to look at the microscopic behavior of matter, of elementary particles and so on. This was an enormous project, the big accelerator being built in Texas, and it got canned during the Clinton administration. It came at a time, in the 90s, when there was one of these waves of anti-science, and in particular anti-physics, that had been building up. It was very much in the context of physics being the science of the 19th and 20th centuries. Let’s move on to biology. My reaction was, “Yes, hard to argue with that.” I think biology will obviously be extraordinarily important in the 21st century, but I also feel that physics will remain extremely important. I felt at that time, and I must say out of ignorance and arrogance maybe, that biology would not become a dominant, serious science unless it also incorporated some of the paradigms of physics. I was quite reactive about this implied attack on physics. I started thinking about that. Maybe I should put my mind where my mouth is and think about biological problems in this context, try to think about it as a physicist. One of the other threads in this story was that I was in my 50s, and I was starting to realize that I was aging and that I was obviously dying. I mean, by natural process. I do come from a short-lived line of men, so I was much more conscious of it than one might have been. I sort of put these two things together and thought, You know, it would be very interesting to think about the physics of aging. Why is it that we age? Why is it that we die? Maybe more importantly, for a physicist’s viewpoint, make it quantitative, where in the hell does 100 years come, from so to speak the scale of human life span? I mean, why is it that no human being, as far as we know, has ever lived more than just over 122 years? Ever. So I set myself as a kind of hobby problem, trying to figure out what the origins of aging and mortality might be, from a physicist’s viewpoint. Can we understand, within that framework, the messy aspects of what goes on, on the surface of this planet, namely, all of life around us? Beginning with aging and mortality, but also therefore about growth, and therefore about ecosystems, and therefore about cities and companies and stock markets and life in general. I thought, “Can you start really thinking in these terms?” That was really where my journey started. To my amazement, it went from being a hobby to very gradually, and sort of unwittingly, to becoming my life. MC: The laws of physics are based on real things that we learned in school, like atomic weight, number of electrons, and bonds between atoms, which are pretty solid. Are the laws underlying life, the things that you’re talking about in this book, are they as solid, as precise, as absolute, as the laws of physics? GW: No, and I think that’s one of the things that one has to come to terms with. As you say, the great power of physics, based on the language of mathematics and the idea that there are a few principles from which everything follows, like Newton’s laws or the kinds of things you just talked about. Some fundamental things from which everything can be derived. For example, from Newton’s laws of motion and Newton’s laws of gravity, we know with great precision the motion of all the planets and concomitantly, the motion of any satellite we put up. That’s why we can use our cell phones so accurately. You have to know that with great precision. Now we come to this other world, so to speak, the world we live in. GW: Life, in particular, and what goes on on this planet in particular, ecosystems and bacteria and cities and love and everything that is part of what we experience. You ask, “Is it conceivable that we could have a few principles and we sort of put them into mathematics and we turn a crank, and out come predictions and understanding of how all these things work?” Well, that’s simply not I think conceivable, and there’s good reasons for that. These are what we term complex adaptive systems. Complex partially implying something we’re all very familiar with, but these systems contain huge number of components, everything from you hae 100 trillion cells in your body. There are seven and a half billion people on this planet. There are even 120,000 odd people living in Santa Fe. Perhaps most importantly, all the systems on the planet to do with life are adapting and evolving. They are continually changing, as the external environment, whatever that may be, changes. Complex systems and in particular what we call complex adaptive systems, it’s traditionally been very hard to analyze them and make them predictive, because they are continually changing and evolving. I think one of the things that is coming to consciousness rapidly, in the 21st century, is that it is exactly these kinds of systems that we now need to deeply understand, because they are the ones that are determining not just our own local fate, but the fate of the entire planet, the global sustainability of the planet. MC: All of that said, in other words that you can’t apply the same kind of super-accurate, absolute laws of physics to complex adaptive life systems, whether it be a human being or an ant or a society or a pond or whatever; nevertheless, you have, and you’ve written a whole book about it, come up with a certain set of laws that you’ve discovered, perhaps because you come at it from that physicist’s point of view. Tell us about what you discovered. GW: What I began to realize is that you shouldn’t, so to speak, throw the baby out with the bath water, to say, Well, it’s so complex, as well as being so complicated, we simply can’t think about it this way—using a physicist’s lens, for example. Because I began to realize that there’s sort of an in-between possibility. That’s something that physicists call “coarse grained.” Roughly speaking, all that means is, to give you an example, it’s extremely unlikely that we’ll be able to predict with great precision exactly when any individual is going to die. On the other hand, we ought to be able to understand and predict the lifespan of an average human being. We ought to have a conceptual framework from which we can calculate why it is we live 100 years and not a million years or 10 years. That was the kind of framework that I started to develop and in fact what this book is all about—taking that idea across the whole spectrum of life from intercellular levels out through biological organisms to cities and companies and so on. The kind of question that is analogous to, Why do we live 100 years, and Why does a mouse only live two to three years, might be, Why is it that we sleep eight hours a night, or Why is it that not only we die but all companies eventually disappear? It’s extremely unusual for a company to live even more than 10 or 20 years, let alone 200 to 300 years. Yet cities, which are also social organizations, like companies, seem to go on living. I mean, it’s very, very difficult to kill a city. Almost none have died. We’ve dropped atom bombs on cities, and 25 years later, they’re thriving. It’s kind of extraordinary. On the other hand, you get a little fluctuation in the stock market, and you lose a TWA or a Montgomery Wards. Hard to believe. At one time, these companies seemed invincible, and yet, 20, 30 years later, they’re gone. Companies are extraordinarily fragile, but cities are extraordinarily robust. Why is that? My work at the Santa Fe Institute in the last 10 to 15 years has been primarily oriented to those questions, and it sort of culminated in this book, which summarized the fruits, so to speak, of that labor. MC: Tell us what you found. Give us the theory. GW: Let me tell you. We have this idea that all organisms evolve by natural selection, by an evolutionary process which has associated with it a certain kind of randomness. Each organism, each organ, each cell type, each genome of that organism has its own unique evolutionary history. That’s the idea of natural selection. You would have expected that if you measured anything about organisms and you plotted it on a graph, such as for example its lifespan–but it could be something trivial like length of its aorta versus its size versus its weight–you would have expected, because of this random history, that there would be only very weak correlations among them, reflecting the randomness in their histories. In actual fact, when you do that, you find exactly the opposite. You find that these points line up beautifully on a line, and the most famous of which is metabolic rate. Basically it corresponds to the question how much food do you need per day to stay alive? You ask the question, How does that vary among all animals, and in particular, across all mammals, from the smallest mammal, which is the shrew, all the way up to the blue whale, which is the biggest. That covers a range of about 100 million in size. The shrew sits on the palm of a hand, and the blue whale is as big as this building. You ask, How does this metabolic rate, how much food does it need per day, how does that change with its weight? What is amazing is, that it follows a very simple law. That’s called a scaling law. That scaling law has some very interesting characteristics. If you forget about natural selection, if you forget about everything I said a moment ago, and you just said, “Well look, if I simply double the size of an organism, I double the number of cells, therefore, you would naively expect to double the amount of energy that’s needed.” That’s not at all what happens. Instead of doubling the amount of energy you need, you only need 75% as much. You save, roughly speaking, 25%, every time you double in size. MC: A 200 pound person doesn’t need twice as much energy as a 100 pound person, to live. MC: They need 1.75 times more. GW: Yes, exactly. Roughly. There’s this savings, and that’s called an economy of scale, the bigger you get. That’s very systematic. It’s not just across mammals. It’s across all organisms, from cells all the way up to ecosystems, the same 25%, one quarter savings. That’s fascinating. But even more fascinating is that if you look at any physiological quantity that you can measure, or any so-called life history event, like how long do you live, how long to you take to mature, et cetera, anything that you can measure and you plot it in the same way versus size, you find a similar systematic behavior that also has built into it this one-quarter kind of savings, on all of these quantities. They all scale in a similar way, so that, for example, if you give me the size of some mammal, give me the weight of some mammal, I can tell you, within 10 to 20% how long it will live, how long it takes to mature, how many offspring it should have, the length of its aorta, how much blood is flowing through the fifth branch of its arterial system, et cetera, et cetera. That’s kind of amazing. This is now predictive, but not quite in the same way that we talked about physics being predictive, to great precision. This is predictive, yes, but to within 10 to 20%. This is true across all different kinds of life, with very different structures. Here’s an interesting thing. The way your aorta scales, the aorta is the first tube that comes out of your heart, that scales across all mammals in exactly the same way that the trunk of a tree scales across all trees. Indeed, almost everything the structure of a tree pretty much is mimicked inside of you, not just in terms of pictures, but in terms of the mathematics. That leads to what it is that underlies all these scaling laws. What underlies it is this idea that the origin of these scaling laws and their universality across all of life, is from the mathematical and physical properties of the networks that sustain us–those networks being things like our circulatory system, or respiratory system, our renal system, even our bones, and our neural system, our brains. All of these systems, which have this tree-like behavior, fractal-like, it is that structure that is the origin of these scaling laws. What we did was put together a kind of fundamental theory based on the generic properties of these networks, that didn’t depend on the specificity of what animal it was, or what species it was, but with just properties of networks that gave rise to these scaling laws. Equally importantly, to the origin of this 25%, this one-quarter, that permeates all of life. MC: When you talk about these networks and you use the word fractal, many people have had the experience of being a little kid and looking at the veins in a leaf and then going up in an airplane for the first time and looking down on the ground and seeing such a similar pattern on the ground, which is the tributaries of rivers. MC: You can also see that same kind of pattern after a rain fall, the way the lines of water flow in the sand. It’s all the same basic kinds of structures. They are virtually universal in life. They’re fractals, and they’re so beautiful. I think there’s something about why we find them beautiful that’s integral to this whole study. GW: Yes, I think so. I agree with that. Even more beautiful, and I wish more people could appreciate it, is the mathematics behind it all. GW: Which is also quite beautiful. One of the things that I tried to do in my book was to bring together all these different kinds of fractal structures. Another aspect that you didn’t mention in your very articulate description of a fractal is that when you take a tree and you just sort of go partway up and then you cut a branch and you take it away and you put it outside the tree, it looks like a little tree. Indeed, it is. It has the same properties as the tree itself. GW: Yeah, you take a piece of that and so on. This is called self-similarity, and it permeates a lot of nature around us. In the theory, it follows very often from this kind of structure optimizing the distribution of energy and resources that keep an organism alive, or the most efficient way of draining a watershed. You have all this kind of approximate optimization that’s going on, leading to these kinds of structures. MC: In some sense, as you say in your book, an elephant and a prairie dog are much more closely related than one might think. An elephant is kind of a scaled up version of a prairie dog that has in its lifetime about the same number of heartbeats. The prairie dog lives shorter but has way more heartbeats, which is kind of amazing. GW: Yeah, so one of the lovely things that comes out of this is to understand this extraordinary fact that even though a whale’s heart beats at a rate of less than probably about 15 times a minute, and shrew, which is this tiny little mouselike thing, beats over a thousand times, shrew only lives a year or two and a whale can live up to 150 years. What is amazing, and sort of kind of a spiritual kind of experience when you first see it, is that they have the same number of heartbeats, roughly speaking, and the theory explains that. MC: One of the things that I think is important to remember when we talk about scaling is that, while one animal is much, much bigger than another, or one tree or fish or whatever, there are some things that are exactly the same, like the size of a whale’s cell is not the size of a coach cushion, and the nucleus isn’t the size of a tennis ball. The mouse cell and the whale cell are approximately the same size. GW: Yes, so that’s a crucial aspect of the theory, actually, is that observation that what we call the terminal unit of the network, that fundamental units, are pretty much the same across a given taxonomic group, meaning all mammals. Among organisms and across pretty much all of life, there are these sort of building blocks that remain the same, from which you build diverse kinds of organisms in order to deal with the challenges in the environment. To put it slightly differently, even though the whale lives in the ocean and the elephant has a trunk and the giraffe has a long neck and we walk on two feet and mice scurry around, actually, we are, to this 80, 90% accuracy, just scaled versions of each other–but scaled in a very sophisticated way. Meaning, it’s not linear. MC: These laws that you’re talking about apparently apply to all organisms. I wanted to ask you, what constitutes an organism? I mean, a dog is an organism. A fly. What about a beehive or a city or a forest? They are more like communities or ecosystems. Do they behave like organisms? Do you draw a distinction between an organism and its ecosystem or its habitat? GW: Yeah, so that’s of course a very good question and a question that people have asked for a very long time. I think even the Greeks were asking to what extent is a city like an organism, or an organism. Certainly in modern literature, we often talk about cities and companies using biological metaphors, the DNA of a company, the metabolism of a city, the ecology of the marketplace, and so on. It does raise the question, to what extent is a beehive or any social insect community as a whole like an organism, and concomitantly, to what extent is a city just like an organism, and following these kinds of laws? That is a segue into where this work led, because it was very natural, given all of the success of this work, to ask, can it be applied to social organization? The first thing that had to be done was ask a question that had actually, to some extent, had already been answered in biology. That is, do cities scale? That is, are cities scaled versions of each other? To put it slightly differently, is New York a scaled up Los Angeles, which is a scaled up Cleveland, which is a scaled up Santa Fe? Is Santa Fe, in some curious way, just a scaled down New York City? Hard to believe. It looks so different. Nevertheless, of course when you think about it a little further, of course pretty much everything New York does, Santa Fe has to do. It has to have roads and shops and people and businesses and everything else that New York has. GW: Water systems and electrical lines and so on. Of course you can only answer that question by looking at data. We discovered that cities do indeed scale. It scaled quite similar to biology. For example, we discovered that the number of gas stations in a city scales, but it scaled similar to biology in the sense that it expressed an economy of scale. Meaning, instead of doubling the number of gas stations if you double the size of a city, we discovered that every time you doubled, you saved about 15% on the number of gas stations you needed. The only difference was it was 15% instead of 25%. Otherwise, it looked pretty much the same. What was even more amazing was it looked the same, the same 15% was true for any infrastructure we looked at in a city. Even more surprising was that that same 15% cropped up when we looked at urban systems in other countries, China and Japan and Latin American cities and European cities. That was surprising and extremely encouraging, seeing that there was a kind of universality among cities. What was truly surprising was when we looked at metrics that have no direct analog in biology, and those are ones that one could call socioeconomic, meaning things like the wages in a city, the number of patents produced in a city, the number of AIDS cases, the number of police, the amount of crime–anyway, we looked at all these things, all things that are involving human beings, and we discovered they, too, scale. Not only that, they all scale in the same way. The number of AIDS cases scales in the same way as the number of patents produced. It scales in the same way, in the United States, as it does in Columbia or Chile or Portugal. This was quite surprising, but was also interesting was that the scaling was different in its nature than the scaling of infrastructure. That was that, instead of it being a 15% savings, which we called sublinear, it was superlinear by 15%. Superlinear meaning that instead of every time you double, you have 15% less per capita, you actually have 15% higher wages, 15% more AIDS cases, 15% more crime, 15% more fancy restaurants, and so on–systematically, across the urban system. This was that the bigger you are, instead of getting less per capita, you have more per capita. That was of all socioeconomic quantities, whether they were good, bad, or ugly. That of course brought up the question that we had in biology, where in the hell do these come from? How can it be that the urban system of Japan behaves in the same way as the urban system of Portugal? It just takes a moment’s thought, and you realize what must have happened. That is, when you realize the main commonality among cities is that they’re for people. They are us. The thing that you begin to realize is, the commonality across cities is the social networking among people and the idea evolves that it must be that the universality, the fact that all these systems behave in the same way across the globe, is because social networks across the globe are pretty much the same. Human beings are pretty much the same across the globe, in terms of the way people interact with each other, the way every human culture has families, it has groups, and it has hierarchies of groups. It is that structure of the social network, as distinct from the infrastructural networks that we were talking about before, like your circulatory system, that it is the physics and mathematics of those networks that is driving this. That forms the origin of the underlying theory as to where these scaling laws come from, so that indeed if you give me the size of an American city, I will tell you, again at the 80-90% level, what the length of all its roads are, how many gas stations it has, how much crime there is, how many lawyers it has, et cetera, et cetera. One of the things that that led to, one of the things we didn’t talk about in biology — The theory in biology, one of its great successes, was to be able to predict our growth curve, that is the fact that we grow very quickly when we’re young and then we stop growing. We spend most of our life in this kind of basically stable state of maturity, and then we die. The theory sort of explains all that. It turns out that the fact that we stop growing is intimately related to the economy of scale that I mentioned earlier on, in metabolic rate, the saving of one-quarter in the doubling of size. That leads to growth eventually stopping. The question then becomes, look, that’s exactly the paradigm we’ve rejected in socioeconomic life. I mean, especially since the industrial revolution, the discovery of fossil fuels, the discovery of entrepreneurship and capitalism. It’s been remarkably successful, and it’s led to this extraordinary standard in equality of life. But inherent in that is open-ended growth, and in fact, one of my questions is, why do cities keep growing and companies die? It turns out, if you apply the same theory, the same model, the same mathematics to the growth of a city as you do to an organism, where in the case of an organism we led to bounded growth–you stopped growing–it turns out the superlinear scaling, the more you have per capita, coming from social networks, leads to open-ended growth. That was lovely, because it made a self-consistent picture. You can sort of understand it without doing any of the mathematics, when you realize what the nature of our social network is. I talk to you. You talk to a friend. He or she talks to someone else. They talk to me. We have these conversations, and we build up ideas. We sort of accelerate each other. Hopefully this conversation will lead to another conversation that will stimulate something and ideas develop. That’s the nature of social networks. That’s how everything works. I mean, almost all of the ideas developed amount to nothing, but every once in a while, an idea leads to quantum mechanics or to inventing automobiles, or something. That’s the nature of who we are.That has this incredibly important, powerful, positive feedback in it. It is that positive feedback which is reflected in the superlinear scaling. The bigger you are, the more you get per capita. MC: That’s a question that I want to come back to in a moment, because it’s a really important question. Namely, when you have open-ended growth, what happens? It seems like a double-edged sword. But let’s continue for a moment in this question of cities. The world is urbanizing rapidly. Human population is increasing, and as you wrote in the book, a million people a week or more are moving to cities. During previous waves of urbanization, we ended up with problems like waterborne diseases, horrible things like cholera and so on, which were solved by chlorination. What are the problems that are coming up now with the current rapid urbanization? Is there an optimal size for cities, where you don’t get too far into the really bad problems that keep scaling up the bigger a city gets? GW: Well, yes, these are hard questions to answer, and they’re very important questions. The question of what are the new problems are I think mostly to do with socioeconomic activity and a kind of curious aspect of the quality of life. One of them that comes out of the theory, something we’re all very conscious of, and that is the speeding up of the pace of life. In biology, the sublinear scaling, the quarter of savings, leads to the slowing of the pace of life. Elephant’s heart beats at a much slower rate than the mouse’s, for example. Everything slows down the bigger you are, and you live longer. In cities, we have sort of the opposite behavior. This positive feedback that comes from social interaction leads to the speeding up of the pace of life. Everything gets faster. We are viscerally aware of that. If you go from here to New York, you certainly feel it. There’s that sense of life speeding up, and the data certainly supports that. That has all kinds of other consequences, about people trying to keep up with the treadmill. Maybe the biggest consequence, one that has bothered me tremendously, is the whole question of whether any of this speeding up is sustainable. You obviously can’t speed up forever. There’s only so fast you can keep things going. That gets reflected in the following. One of the successes of this theory is that it gives rise to an understanding of why cities have open-ended growth in contradistinction to all of life. Cities seem to have this open-ended growth. Economies keep growing, and so on. Our whole existence at the moment is based on that, is based on having GDP that continues to expand at an exponential rate. This does have built into it a fatal flaw. I hope it’s not a fatal flaw in theory. It’s a fatal flaw in the conclusion to the theory, and is that it has built into it what is terms mathematically a finite time singularity. That’s the technical phrase for it. All it means is that whatever it is that we’re measuring about a city, it could be from the number of patents produced to the number of murders, is eventually become infinite. Which is clearly nuts. You can’t have that. It becomes infinite in a finite time. That’s the important thing. Meaning, that it’s going to happen in five years time, 10 years time, or 100 years time, but it’s going to happen. Something crazy is going to happen, and the system will collapse. That’s what it says. MC: What would be a concrete example, to help people understand what you’re talking about? GW: It would be the amount of crime would become, if you like, infinitely big, totally unbounded, so there’d be 100 more crimes than there are people the planet. That doesn’t make any sense, obviously. Well before then, the system collapses. That’s what the theory tells you, that it collapses. It’s a more sophisticated modern version of what’s called the Malthusian paradox, that Malthus first proposed way back at the end of the 18th century, that exponential growth could not be sustained. This is not exponential growth. This is faster than exponential, which makes it much worse. The argument against Malthus and of the population bomb was always that we are going to innovate our way out of it. MC: Basically, if I understand right, you have this exponential growth that happens when people come together, especially in cities, and whatever the problem is at hand, you just mentioned population growth, or crime, or a problem in disease, the theory says that that problem will grow to a place that causes collapse. The way we find our way out of that is through innovation, or invention. I think that’s one of the most fascinating parts of your book, this idea that for every problem we have so far, we seem to have solved it with an innovation, but those innovations used to be, what, a few thousand years apart? A few hundred years apart? MC: Or a few decades apart. It’s accelerating. GW: The theory says that you can avoid the collapse, just as you said, by a great invention, a great paradigm shift, a great innovation, agricultural being a major one. It could be the discovery of coal. It could be the invention of computers. MC: Or back in the day, the printing press. GW: Printing press, or discovering iron. What this does is reset the clock. It’s almost as if you start over again with this new … As we felt we did with once we suddenly realized we had the internet and IT, my God, everything changed almost like starting over again. We have this marvelous sequence of events which have sustained us, that we grow, we might be heading for collapse, but before then, we make some remarkable resetting of the clock by reinventing ourselves by major innovation. That has been fantastic, and that’s the system under which we operate and which I would say most economists believe, or most people who have thought about this, believe. The catch in it is that, yes, we can do that, but we have to do it at a faster and faster pace. It’s not only that life gets faster, but you have to innovate faster and faster. Just as you said, something that might have taken 100 or 200 years, 1,000 years ago, now has to take 15 years or 20 years. Soon it has to take 10 years. Then it has to take five years, and so on. It’s like being on an accelerating treadmill, a treadmill that’s going faster and faster, and you have to keep up with it. But it’s worse than that because every once in a while, you have to jump to another treadmill that’s going even faster, and you have to keep making these jumps at a faster and faster rate. It’s hard to see how that is going to be sustainable and that you’re not going to have a socioeconomic heart attack. MC: Well, especially since we continue to be organisms that need eight hours of sleep a night, and those things don’t change. MC: I mean, the pace of life can get faster, but there’s only so much faster. GW: We’re still us. That’s right. We are still us. Human beings have always needed approximately eight hours of sleep a night, for example. We can only do certain things. Our brain is not significantly different than it was 10 or 100,000 years ago. Certainly our bodies aren’t. Yet, we’ve discovered this extraordinary process by interacting with each other, having discovered language, language was of course the progenitor of all this, that has led to this marvelous life that we have. But it seems to have built into it the potential for its own destruction. GW: Yeah, this is the big issue. All this is of course, needless to say, somewhat speculative, but I find it very compelling. It certainly agrees with the data. What it says, to paraphrase what you said, is that, sure, this innovation resets the clock and it produces all kinds of new marvelous things, but all it’s doing is postponing. It’s not solving. It’s just postponing to the next one. You have to keep that postponement going faster and faster. The question is, how can we change this? MC: Which speaks to the big, big question that everybody talks about all the time, which is genuine sustainability. GW: Yes. Is there the possibility of truly longterm sustainability, into the foreseeable future? Of course that does depend on all kinds of other things, like resources and energy and so forth, but what I’m saying here is, independent of that, we have a problem to begin with. That compounds the problem because many of the innovations are to do with energy, have to do with, will have to do with energy, and we use resources. On the other hand, just a side comment to that, and this is a bit of a platitude, we have potentially an infinite resource that has brought us all the way here, and that’s of course the sun. We have all the energy we need. We don’t harness it. What we harness is energy from the sun that was stored under the earth for a long time, and now we’re using it up. We need, of course, as many have argued, to return to being sustained by an external source and not an internal source. That’s a whole other subject, but that is part of the longterm sustainability, inevitably. On a more conceptual level, the question is, can we get away from this treadmill effect? I will really go way out there on this one. Two things: One is, it might be helpful, first of all, to redefine growth. This is, again, certainly not original with me. Because we’ve been so economically oriented that we’ve defined growth purely in terms of something like the GDP. Clearly we need to augment this and possibly replace it with something that’s more like quality of life index, happiness index, something that redefines growth, that gets us rethinking and thinking differently about what it is we want to grow and who we want to be, who we want our children to be, what we want our civilization to be. That takes me back to the theory. I grow quite cynical, skeptical about possibilities of really doing anything, because we’ve left it so late. It’s so late in the game. These changes are coming along so quickly. It’s sort of frightening. The idea that we can make these changes in a short enough period of time to readjust everything seemed to me anyway, extremely unlikely. MC: I couldn’t help but wondering whether the key to sustainability and the key to genuinely healthy not only ecosystems but economies that can last for a while, without using up all of our resources at an exponential speed and so on–whether that’s not contained precisely in your study of scaling laws of ecosystems. For example, you have an organism, you have a tree that grows and grows and then it reaches maturity, and in its maturity it gives fruit. It gives fruit for a long time, as long as it has enough sun and water, but it doesn’t give more fruit every year. It gives a certain amount of fruit, and it’s in a healthy ecosystem where there’s other kinds of food sources and other kinds of animals that are living in a kind of equilibrium with one another. The pace of life in the orchard or in the forest or in the savannah isn’t speeding up. It is maintaining an equilibrium based on the scaling laws that you described so eloquently in this book. GW: Implied in what you said is a really deep question that we have to face, associated with sustainability. Indeed what you say, I think is correct, in the so called natural world, out there. In fact, while we were still hunter/gatherers and were essentially in meta-equilibrium with all the other creatures on the planet, life did not speed up, so to speak. Things were continually changing, but in a way where there was a kind of meta-stability over relatively long periods of time. Of course there was evolution. There were changes. There were some drastic changes, but overall life was sustainable. It’s to do with that slowing of the pace of life the bigger you get, is intimately related to that. Life was sustainable, even though it was continually changing. You did lose species. You gained new ones, and so on. If we move that into the socioeconomic sphere, we’ve been discussing the opposite, and we have the big problem that, yes, it would be lovely if we could get through this period, if we somehow could get through all this, and gradually so to speak asymptote to a stable configuration like we were. We’d have to give up things. Can we give it up? Can we make a fundamental change and not be driven by wanting more and needing to grow? The fundamental question is, can we have the standard and quality of life, the kind of exciting, vibrant society that we have developed just in the last few hundred years, really, and all the things that we want and have it indeed for the present 7.5 billion people on this planet, which maybe rises to 12 billion by the beginning of the next century, can we have all that without growth? In the sense that we’ve been using it. Can we have a socioeconomic system or an economic system that does not always have growth built into it, and still have what we have? Look, if you look at all the Nobel prizes in economics that have ever been, I would say you don’t have to scratch very deep on the surface to find that all of them somewhere assume that you have open-ended, exponential growth, period. GW: Forever. That’s just built in, in some way. Now, that’s a cartoon statement, again, but it’s an indication of we’ve given very little thought to can we have a different configuration. Can we sort of have our cake and eat it, too? That’s what I try to think about, and I think it’s the fundamental question. I’m disappointed. That’s my disappointment with having a President Trump. I was always disappointed, by the way, with President Obama that we didn’t start a mammoth program on trying to understand, bringing in what I quaintly call the grand unified theory of sustainability. We need to bring all of the people that have thought about this, from agriculturalists, to economists, to politicians, to physicists, to everybody, policymakers. Everybody should be involved in some way or another, in trying to understand this problem and formulation … And it needs to be international. We’ve never had any leadership in this. The nearest we came to it, in a tiny way, was when Al Gore, with his climate change stuff, which was very credible but was extremely limited, actually. MC: It’s interesting to me, too, because capitalism appropriates the language of evolution and natural selection in so many ways. In some ways, the invisible hand kind of maps onto natural selection, and the survival of the fittest is applied to companies, and even evolutionary niches and market niches. Yet, the ecosystems that are talking about are not in a state of continual growth. GW: Exactly. This is one of the great misleading things. It goes back to the question, to what extent are cities and economic systems organisms? In a way, I think that exactly what you said, the invisible hand and the ideas of economic growth and evolutionary processes has mimicked biology. There is indeed a strong connection, I believe, conceptually. However, it’s misleading because the outcome is so different and because nowhere in biology, outside of us, are animals talking to one another and figuring things out. The bears and the giraffes and the microbes don’t sit around getting worried about the future of the planet, or their own future for that matter. They just do. They live. They’re part of it, but they don’t care. The extraordinary thing about the universe, as far as I can tell, no one cares except us. It would be so tragic if we lose all this. MC: We got to where we are and these trees and these fish and these beautiful things that are all around us, maybe they didn’t get there through caring, but they got there through an evolutionary process, which was profoundly creative. Our cities go to the way they are through an evolutionary process which was also profoundly creative. GW: But the time scales were so different. The dynamic was actually different, in the sense that it was the cities got there through something that is metaphorically the same, but the dynamic of people talking to one another and creating things over periods of tens of years rather than hundreds of thousands or hundreds of millions of years, is completely different. It’s led to this huge open-ended, exponential growth, which you don’t see generically in biology. You see it locally in biology sometimes, and then it leads to stagnation and collapse, usually. MC: What is your hope for how your work might be used for people who are considering these very deep and sometimes scary problems? GW: Well, I wrote this book for lots of reasons. Some were quite personal. One was to get people to think about some of these problems and to stimulate a conversation, a discussion, to think much bigger, in much bigger terms. I find that much of the thinking, more and more, is becoming narrower and narrower. We need to broaden it out, and we need to bring all of the constituents into the conversation. The idea of the book was to give that as a message, but also in a framework that I think is very important to develop. That is, to make it quantitative, principled, and somehow analytic, to really try to understand, get a deeper understanding. Part of the faith is that to solve problems, truly solve problems, long term, you need to understand the dynamic. You can fix them for short periods of time without having any deep understanding, but longterm you really need to dig deep. I don’t feel we’re digging deep enough or broad enough. MC: Geoff West, thank you so much for being with us. GW: Thank you, Mary-Charlotte. Appreciate you having me, and for staying with the conversation so long.